I am pleased to announce that the project I started nearly a year ago, to decompile The Proxomitron completely, analyse and rebuild it, is nearing its end! Here is the first release of the rebuilt Proxomitron, "marketing version" 4.5R+, "true version" 4.5.1.0! Note that Scott's original 4.5J is either 4.5.0.0 or 4.5.0.4 depending on where you look. - OpenSSL support includes the latest version of my patches, so you will need to use OpenSSL 1.0.1. These DLLs should work. The binary is a drop-in replacement for 4.5J so just put it alongside your existing one and try it out. This also means it should be relatively easy to switch between the two if you think you found something that's broken. As always, I disclaim responsibility for any damages etc., and you are advised to back up any configuration and such before testing! A full release, with source, will come later. Please test with latest updated version, since bugs introduced may have been fixed already due to someone else's previous report. - Fix use-after-free when click OK button for remote proxy selector - the original code in 4.5J has this bug; it is only because of luck that it wasn't discovered all this time. - Stabilise and refine header filter ordering - URL: filters are now applied first, and also show first in the list. They are sorted respectively alphabetically. - Clarify file URLs for opening blocklists: URL commands must be enabled to do so, and if not, a warning message is shown. - Fix date checking for If-Modified-Since in local file requests. Original code would always respond with "not modified", possibly causing caching problems with local file replacements. - Fix Show URL in browser for https and add option to include scheme. When adding a URL to a blocklist, the menu option to open in browser was broken for https URLs. Now that has been fixed, and a checkbox added to allow you to include the scheme (https:// or http://) when adding to the list. - Fix unintentional sign-extension in base-64 encoding. Non-ASCII basswords and such should now encode and decode correctly. - Fix allow IP range comparison. This was accidentally introduced in the rebuild and not in 4.5j. - Fix Allow for Session certificate dialog with multiple parallel connections. It will not continue asking the same host if you have multiple parallel connections and already said Allow for Session once. - Various cleanup/removal of dead-ends in code. (May. 19, 2018 07:34 PM)amy Wrote: I am pleased to announce that the project I started nearly a year ago, to decompile The Proxomitron completely, analyse and rebuild it, is nearing its end! I do not see that problem on that site. 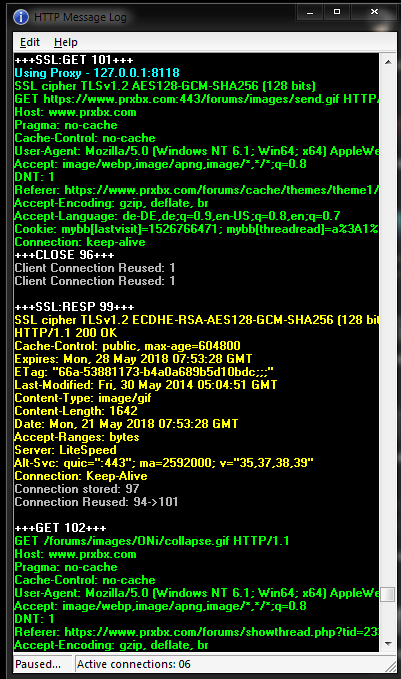 Have you tried the OpenSSL DLLs I linked to? Fixed parsing of $KEYCHK() function in 4.5.1.1. That could be related to the bug I introduced in parsing $KEYCHK() function. Please retest with 4.5.1.1.
all filters didn't work normaly. no effect at all. Yes, this ssl-pack. The problem is "--cipher-suite-blacklist=0x009d,0x009c,0x003d,0x0035,0x003c,0x002f,0x000a,0x00c0,0x00ba,0x0084,0x0041,0x00fd,0x000a,0x002f,0x0035,0x003c,0x003d,0x0016,0xc0a1,0xc0a0,0xc012,0xc008,0x009c,0x009d"
For those experiencing crashes, try to find the detail log in Event Viewer (it should look something like this but with proxo.exe) and either post message here or PM me if you don't want to make it public, otherwise it is very hard to determine where/why it is happening. Quote: The problem is "--cipher-suite-blacklist=0x009d,0x009c,0x003d,0x0035,0x003c,0x002f,0x000a,0x00c0,0x00ba,0x0084,0x0041,0x00fd,0x000a,0x002f,0x0035,0x003c,0x003d,0x0016,0xc0a1,0xc0a0,0xc012,0xc008,0x009c,0x009d"
This one could be related to a use-after-free bug in Scott's original code which I uncovered, it also could cause a crash in the right circumstances. Basically, if a flag is set on an external proxy item it is freed, but then the code tries to change a different flag on it regardless. Will release 4.5.1.2 to fix this (note this is a change over the original code, but is necessary to prevent a possible crash.) But if I set up a proxy and select Use Remote Proxy, I can see that it uses it. Using Opera portable on Win10 64bit. Opera starts with switches, --ignore-certificate-errors --allow-insecure-localhost --disable-update --allow-running-insecure-content. 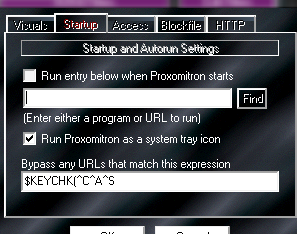 Proxomitron folder is new with patched 'proxomitron.exe', 'proxo.exe', and SSL related files. amydefault.cfg (Size: 17.81 KB / Downloads: 140) . 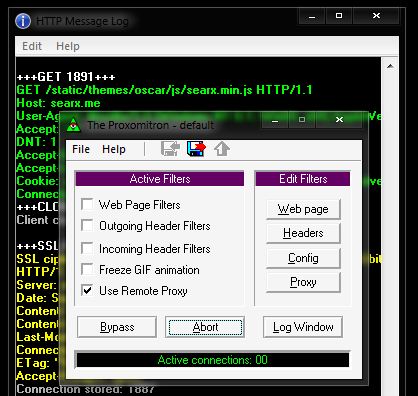 'Proxo.exe' web page filters are not filtering by default. Log window, page source, nor 'HTML Debug info' show hits. However, filtering is enabled for 'HTML Debug info' after $FILTER(1)(^) is added to Bypass. After enabling 'HTML Debug info' and adding '$FILTER(1)(^)' to Bypass, 'Proxo.exe' shows hits for only 'Banner Blaster (limit text)'. These 'Banner Blaster (limit text)' hits are incorrect. It looks like 'Proxo.exe' is failing to consider the '&' conditionals. appears to match everything and maybe nothing. <end> may not be working, since 'Restore pop-ups after a page loads' uses it. Filter import via right click menu is broken. Edit: Added "In the Test window"
Edit2: Same in 'HTML Debug info'. [s] tags added, text reverted to original.